TWO MOONS orbit Mars: Phobos (mean diameter, 22.0 km) and Deimos (mean diameter, 14.0 km). As part of the centennial celebration commemorating Asaph Hall's discovery of Phobos and Deimos in 1877, an extensive exploration of the two Martian moons was conducted with the Viking orbiters. The spectacular high-resolution imaging data obtained have rivaled in resolution any previous flyby or orbiter imaging data on any body in our solar system. These data provided much more knowledge of the moons' surface morphology and their physical and dynamical properties. Phobos was observed to be somewhat smaller than determined by Mariner 9 (~5200 km3 rather than 5700 km3 ), and Deimos was somewhat larger (~1200 km3 rather than 1000 km3). Both satellites are locked into a stable, synchronous rotation about Mars, with their longest axes pointing toward Mars and their shortest axes normal to their orbit planes (which are within a few degrees of Mars' equator). Both satellites have topographic variations as large as 20 percent of local mean radii, and Deimos has a few large flat areas. 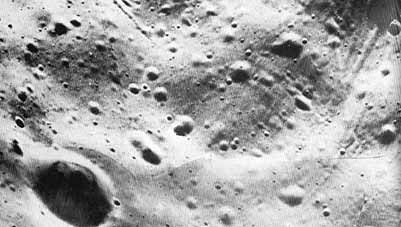 Viking found Phobos and Deimos to be within 10 to 15 km of their predicted positions based on Mariner 9 images. Precessing ellipses accurately model the orbits of the two moons, with short-period Mars gravity perturbations having displacement amplitudes of less than a few kilometers on Phobos' orbit, and solar perturbations having displacement amplitudes of less than 5 km for Deimos (except for one 110-km, 54-year periodic longitude perturbation). Phobos, one of the three satellites in our solar system whose period (7h 39m ) is less than the rotational period of the primary planet (24h 37m for Mars), is losing orbital energy to surface tides it raises on Mars. As the orbit of Phobos decays and gets closer to Mars, Phobos may eventually be torn apart when the tidal forces of Mars overcome the cohesive bond between its particles. Phobos, already inside the "Roche Limit" where internal gravity alone is too weak to hold it together, could conceivably become a ring plane about Mars within the next 50 million years. Phobos and Deimos are both uniformly gray. Albedos of ~0.06 put both in a class with the darkest objects in our solar system. These dark surfaces appear to be layers of regolith with depths of a few hundred meters for Phobos and at least 5 to 10 meters for Deimos. Cratering of the surface of Phobos continued during and after the formation of the regolith, and the regolith is saturated with craters. However, on Deimos it appears that the regolith continued to develop after the cratering subsided, and the smaller craters (<100 meters) are partially filled or covered. This obscuration of the smaller craters gives Deimos a much smoother appearance than Phobos when  viewed at ranges of more than a few hundred kilometers, because the filled craters are near or below the resolving power of the cameras and therefore are not visible. In contrast to the smooth appearance of Deimos, the surface of Phobos is dominated by sharp, fresh-looking craters of all sizes and a vast network of linear features resembling crater chains. These linear grooves, up to tens of kilometers long and hundreds of meters across, appear to be surface fractures associated with the formation of Stickney, the largest crater on Phobos. Crater densities on both satellites are comparable to densities on the lunar uplands, a fact that suggests ages of up to a few billion years. However, impact fluxes may have been significantly higher for Phobos and Deimos because of ejecta being thrown into orbit about Mars and then recollected as the satellites swept it up in their orbits. Similar networks of striations have not been identified on Deimos; however, they may have been covered by regolith, and picture resolution may not have been sufficient to identify such features. For example, a large depression 10 km across at the south pole of Deimos may have been caused by a single impact or may have been the result of fragmentation if Deimos was once part of a larger body. Linear features radiating from the center of this depression are suggested by the data, but low picture resolution has limited any interpretation of these features or determination of the origin of the large depression. The close encounters with Phobos and Deimos have yielded preliminary mass determinations of approximately 1 X 1016 and 2 X 1015 kg, respectively. Using the volumes mentioned earlier, mean densities of about 1900kg/m3 for Phobos and 1400 kg/m3 for Deimos are obtained. These low densities, as well as their colors and albedos, make Phobos and Deimos compositionally similar to Type-l carbonaceous chondrites found in the asteroid belt. These data strongly suggest capture as the origin of the two asteroid-like moons of Mars. Viking also obtained pictures of Phobos and Deimos, or their shadows, against Mars. The transit pictures were used in refining knowledge of the shapes of the satellites, and the shadow pictures helped locate Viking Lander 1. The satellite and shadow images were used to improve map coordinates of features on Mars surrounding the images.